You know I'm always talking about how basics pieces are the most important part to build your wardrobe. Black pants, a good blazer, a white buttoned shirt , a camel coat. Something just as important and that most of us wear almost every day are our always loved denim Jeans. A good, well fitted pair of dark wash denim is a MUST. It can be paired with jeans and a t-shirt for casual look, or you can dress them up paired with a blazer and pumps. The jeans I'm wearing today are from Re/Done and for me they are THE PERFECT dark wash jeans. The price tag may be a little hefty but these are not your typical stretchy denim jean. This denim is the real deal, repurposed vintage Levi's denim perfectly tailored into a new style that will fit like a glove and will last forever. I think whar RE/DONE is doing is amazing and you can read more about it HERE. 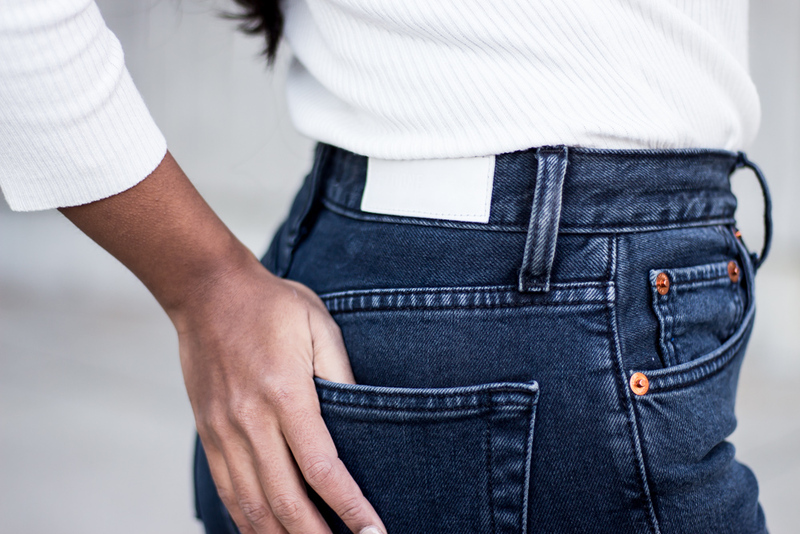 As far as sizing, you need to remember that this denim is not stretchy, so it can be a little bit of a struggle for us peachy girls. I'm wearing a size 27 and I think they run just a tad tight which doesn't botter me at all because I wanted perfectly fitted jeans. However if you want a more relaxed fit, you may consider to order a size up.